Every year, more than 6 million Christmas trees are bought in the UK, leaving us with a huge rubbish problem once the festive season is over. If even half of the population chose a real Christmas tree rather than an artificial one, it would be good news for the planet because research has shown that artificial trees are more damaging to the environment. While many people believe fake trees are the best option because they can be used for a number of years and save a 'real' tree from the chop, artificial trees actually require a large amount of energy to produce and are usually made from metal and PVC derivatives. The PVC manufacturing process creates and disperses dioxins (the most toxic manmade chemical around) and lead is also used in the process. The process also creates other by-products which are both harmful to us and the environment. Fake trees have a life expectancy of around six years – but they then end up in landfill posing a long-term pollution problem since they aren’t naturally biodegradable. So How Good is the Real Alternative? America’s National Christmas Tree Association says real Christmas trees are eco-friendly because they are a renewable resource and can be recycled. As they decompose they also send nutrients back into the soil. Trees are carbon neutral because during the time they are growing, they absorb carbon dioxide and produce oxygen. Of course there are some (non-environmental) disadvantages of buying a real tree – including the mess they can cause and the need for upkeep through the Christmas season but these are pretty minor nuisances. 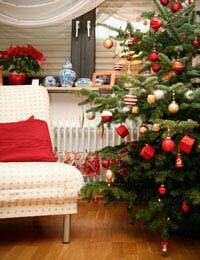 The best idea of course is not to buy a Christmas tree at all – but that’s not really an option for most of us. However, if you are planning to be away over the Christmas holiday itself, you might want to consider simply decorating or lighting an outdoor tree in your garden. Alternatively, if you have a large indoor plant you could dress it with Christmas ornaments rather than buy a tree. Otherwise, consider buying a potted fir tree. Keep it indoors until the New Year and then plant it outside – or keep it in a pot in the garden and bring in again next year. People buying real Christmas trees often worry about it being cut down – but most reputable growers plant at least two or three new trees for each one they cut. If you still feel bad about it, there are many organisations which allow you to pay to have a tree planted. This is a great idea – a Christmas gift to the planet - because every tree planted helps to reduce the global carbon footprint. Look out for local collection points where trees are shredded and turned into bark chippings. Many tree farms now operate a ‘green’ tree disposal service and will collect from your house. Your local council might have a recycling service – and some offer pick-up if you can’t transport your tree to a tip. Of course, it isn’t just the tree that causes an environmental problem at Christmas. Many people buy new baubles, tinsel and tree decorations every year – which means additional manufacturing – and the cast-offs ending up in landfill. If your decorations are looking tired, why not consider making some unique decorations of your own? Make cookies with the kids, wrap them up and hang them on your tree. (Best of all, you get to eat them at some point! Hang old CDs with the reverse side showing – they’ll reflect your tree lights and are particularly good for outdoor Christmas trees. If you don’t want to settle for plain CDs, you can now buy recycled hearts and stars made from old CDs. Stick to the traditional candy cane idea and after Christmas, hand them out to family and friends. Make colourful paper chains from old magazines and drape them around the tree instead of using tinsel. Children will love to help and you can make them more interesting by adding glitter.